A sugar maple or “sugar bush” that Janet Anderson has been tapping in her back yard for several years. Our piles of snow are disappearing, daylight savings time has arrived, and March 20 marked the official arrival of spring, although the weather reporters say that meteorological spring began on March 1. There’s no better time than spring to think of our native maple trees, especially sugar maples and red maples. Everyone’s favorite native maple is, of course, the sugar maple (Acer saccharum). At this time of year, the combination of increasing daylight and increasing temperatures gets the sap flowing, making it maple syrup season in New England, the northeast in general, and Canada. More precisely, that season arrives when nights are still below freezing and daytime temperatures are warm (about 40-45 degrees F). In spite of the new activity inside them, the sugar maple trees look pretty much the same, unless you happen to notice a place where a squirrel has bitten the bark or a bird has pecked a hole, allowing sap to drip out. These wild creatures and others then return to lick sap. Often with snow still on the ground, commercial and home-based operations get busy tapping sugar maple trees, collecting sap, and boiling it down to make maple syrup. The sap contains about 2-3 percent sugar. It takes a lot of sap to make syrup – about 40 gallons of sugar maple sap to make one gallon of syrup. Local maple syrup demonstrations help us celebrate the season, as did one this year in February by the Westborough Community Land Trust’s Janet Anderson. She ran a program in her home and back yard demonstrating how to make maple syrup inexpensively at home using a few items from a hardware store. Have you ever wondered what a “sugar bush” is? 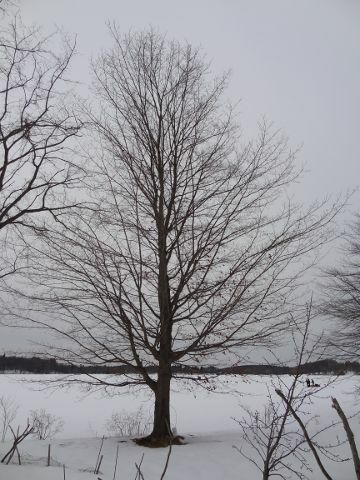 It’s another name for a sugar maple, especially one being tapped for sap. Other names are hard maple and rock maple, due to the tree’s relatively hard wood which has long been prized for making furniture, floors, cabinets, and musical instruments. Besides sugar, the leaves of sugar maple contain calcium, which helps to make the soil less acidic when the fallen leaves fall decay. Red maples (Acer rubrum) can also be tapped to make maple syrup, but the sap contains less sugar so more must be collected. About 60 gallons of sap from red maples is needed to make one gallon of syrup. In fact, just about any native maple can be tapped for maple syrup-making. If you’re yearning for signs of spring, keep an eye on the treetops. Many people think fondly of red maples because their small red blossoms are one of the first sure signs of spring. Usually in late March, well before the leaves come out, these small red flowers lend a red color to the treetops. March winds pollinate the flowers. Later, the emerging new leaves are also red while they’re small. Red maple is also known as swamp maple because it often grows in swamps. Another name is soft maple because its wood is not as hard as sugar maple wood. Red maple is the state tree of Rhode Island. Less popular now than when they were first widely planted decades ago are the Norway maples (Acer plantanoides) in towns in our area. They’re the most widely planted street trees in the U.S. As the name suggests, Norway maples are non-native. They are hardier than sugar maples when it comes to withstanding air pollution and road salt, but they have proven to be invasive. (Their abundant seeds – which you may know if you have to rake them in your yard in spring – spread to the woods where Norway maples can outcompete native trees.) Also, their sap is milky and not suitable for making maple syrup. Break a leaf stalk in spring or summer and you’ll see milky white sap ooze out. That’s one good way to identify a Norway maple. But how can you tell apart the different kinds of maples? You can learn the differences among their leaves, but the easiest way to identify red, sugar, silver, and Norway maples is to wait until fall. Then the timing and color of their fall foliage is a very good clue. Red maples are among the first trees to show fall color, typically in early or mid-September, and they’re blazing red. Unfortunately, in many years, winds take down the wonderful red leaves before the rest of the trees have changed color. Silver maples are next. Their leaves typically turn bright yellow in late September. Sugar maples are distinctive in October because of their famous multicolored display of red, orange, yellow, and green, often all on the same tree at once, or even all in the same leaf. Norway maples stay green and keep their leaves longer than most native trees, often into November. If you’re raking recently fallen maple leaves as Thanksgiving approaches, you probably have a Norway maple nearby. (Similarly, many non-native invasive plants also keep their green leaves longer than the local native vegetation does.) Norway maple leaves typically turn dull yellow. 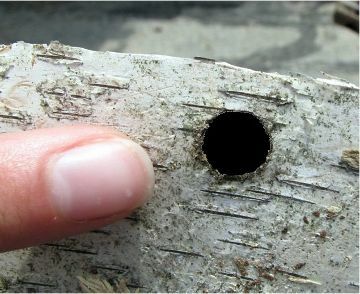 Exit holes like this one are a sign that the Asian longhorned beetle (ALB) has infested a maple or other tree. These holes are perfectly round, about the size of a pencil eraser, and at least 1 inch deep. ALB adults leave these tell-tale exit holes when they chew their way out of a tree after developing inside. As you may have heard, the ALB has recently been detected again in the Worcester area. So if you’re out looking at maples, keep an eye out for the tell-tale exit holes in the trunk or branches. Trees are usually full of holes, but these exit holes are perfectly round, about 3/8-inch wide (a bit smaller than a dime, or about the size of a pencil eraser), and at least one inch deep. If you think you’ve found this sign of ALB activity, report it on the Worcester hotline (1-866-702-9938).